The series’ defending champ made light work of the choppy conditions as he cruised past the world class field that assembled for the popular weekend-starter at Addington Beach in Durban. 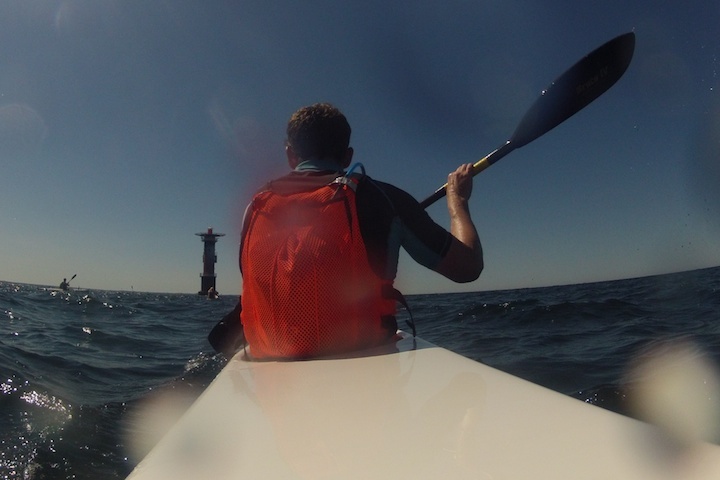 “There wasn’t much assistance out there and, with there being no wind at all, it was really hot – almost like sitting in a heated room the whole way – so you just had to put your head down and work hard,” he added. 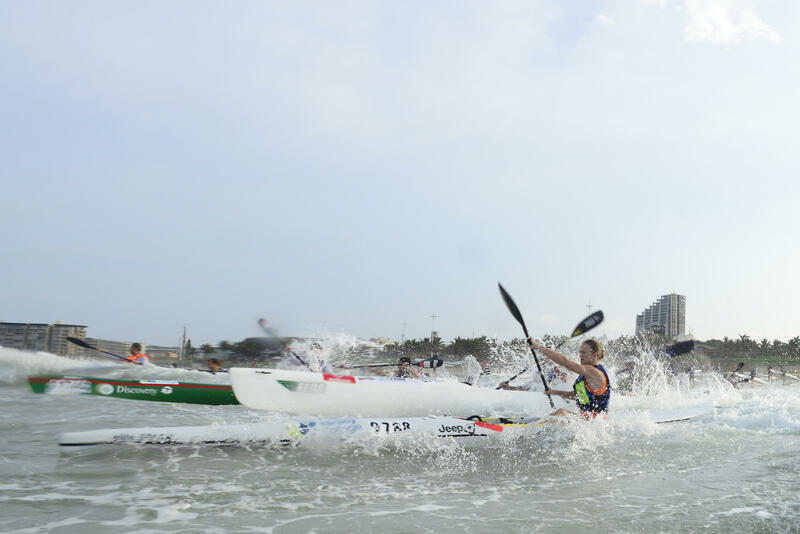 Having pulled away on the very first leg of the 2 lap, 8km course, McGregor never looked back and soon he had a unassailable lead, leaving him to pick off the doubles crews in front of him one at a time. 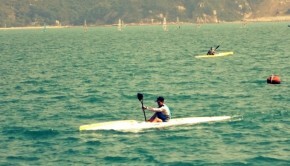 A fast returning to fitness Matt Bouman (Epic Kayaks) did his level best to stay with McGregor however a lapse in determination midway through the clash saw him fall off the pace and then a packet getting stuck on his rudder late in the contest put pay to any hopes he had of maintaining the gap between himself and the uncatchable leader. 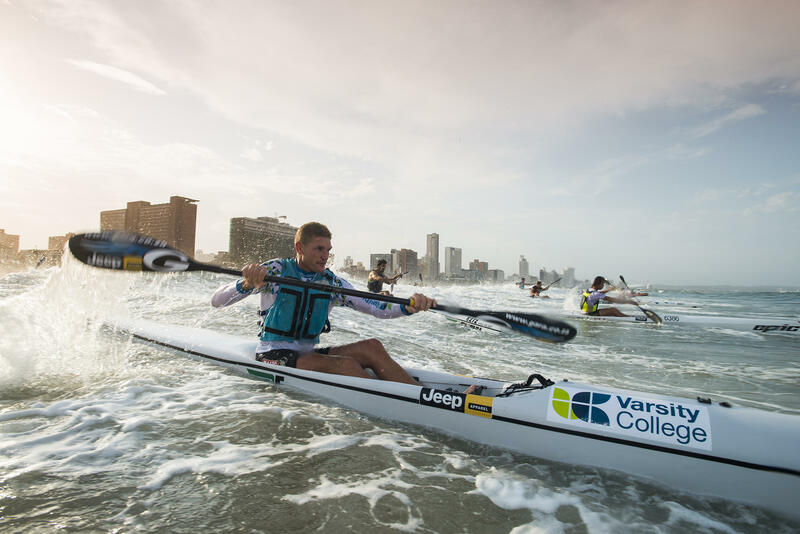 Grant van der Walt (Varsity College/Epic Kayaks) made his first appearance of the 2014 series and, off the back of his remarkable third place effort at last weekend’s N3TC Drak Challenge, again made the bottom step on the podium his own whilst Quinton Rutherford and Wade Krieger rounded out the top five. 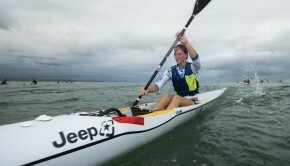 Michelle Burn (Fenn/Team Jeep) dominated proceedings in the ladies race. Series’ seasoned star Michelle Burn (Fenn/Team Jeep) once again claimed victory in the women’s race as she cruised home ahead of a strong women’s field bursting with talent and, astoundingly, was the fifth single across the line behind Rutherford. Danica Bartho (Fenn/Bartho’s Fish Co.) made a welcome return to the series, claiming second, with Jenna Ward finishing third. 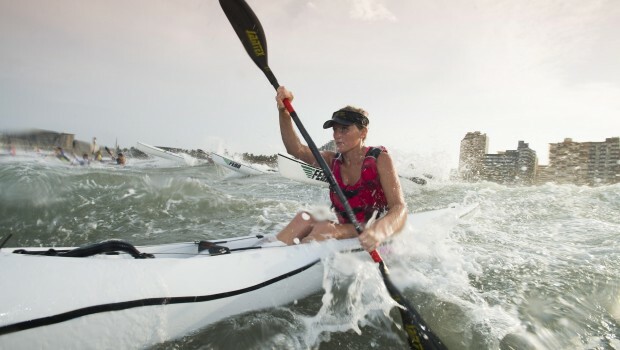 “I definitely am feeling a lot stronger now that we’re a couple of races into the series and I think Drak also really helped get my fitness back up there again,” added the 2014 Drak Challenge women’s third place finisher. 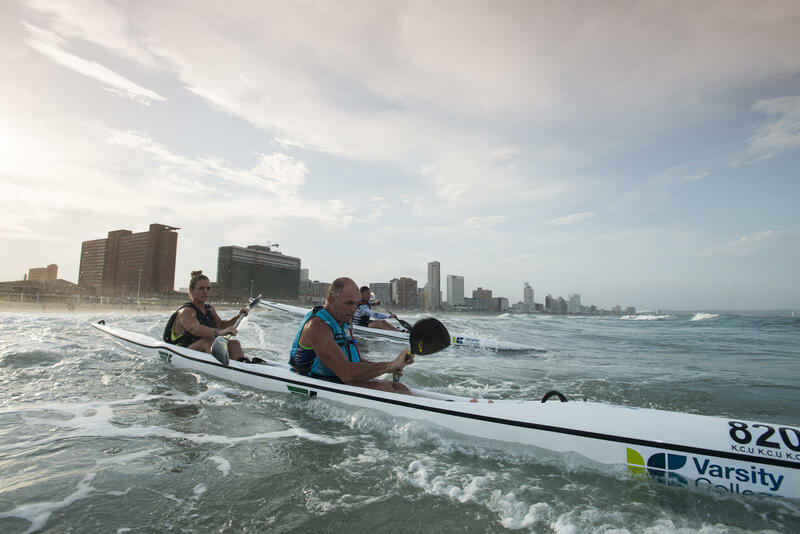 With the 2014 Dusi Canoe Marathon just around the corner, countless top contenders took advantage the surfski hit-out provided to spend some time in a boat as a pair. 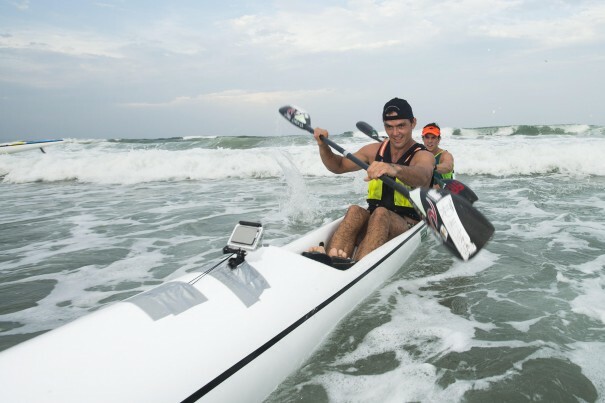 Mark Mulder and Dave Chaplin enjoyed another pre-Dusi Canoe Marathon hit-out as they claimed victory in the doubles section. Mark Mulder and Dave Chaplin claimed the doubles race victory with fellow Dusi combination Adam Nisbet and Len Jenkins finishing third and Simon van Gysen and Craig Turton sixth with Luke Nisbet and Anna Notten the first mixed double across the line. 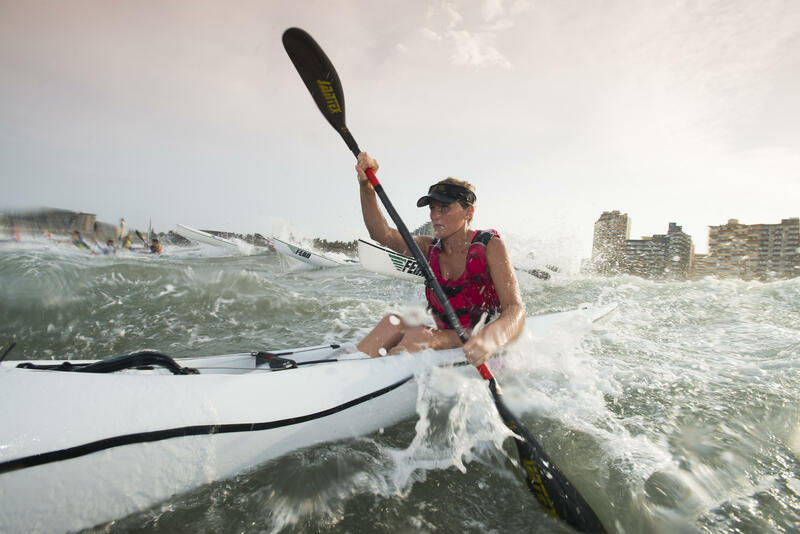 Jenna Ward was one of a host of talented female paddlers to tackle in the McCarthy Toyota Kingsmead Durban Surfski Challenge, ultimately finishing third behind Michelle Burn and Danica Bartho. 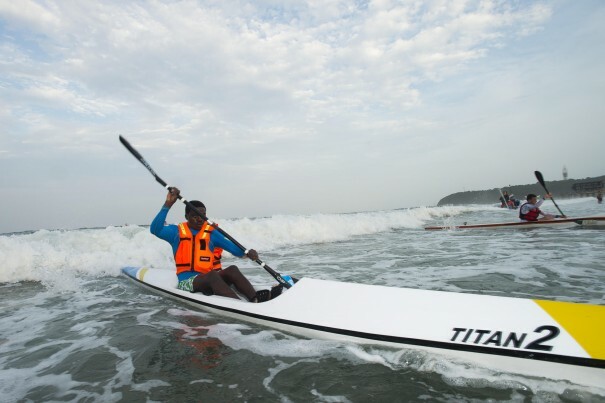 Sipho Luthuli cantered home having negotiated the tricky surf in race three of the 2014 Varsity College Marine Surfski Series. 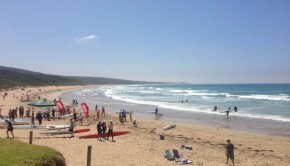 Having been pleased with the race two record field last Friday, organisers were beaming from ear to ear with the strong crowd of over 210 paddlers that headed out on the warm waters of Durban’s bay whilst scores more lined the shoreline, cheering on their paddlers, playing in the sand or taking part in the free weekly Keiki bodyboarding clinic. Father/daughter crew of Richard and Collette Saunt make their way out through the surf at the start of the McCarthy Toyota Kingsmead Durban Surfski Challenge, race three of the 2014 Varsity College Marine Surfski Series.